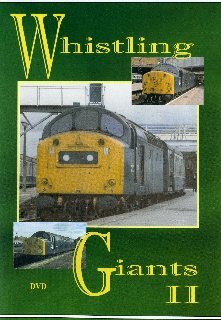 Produced by GLOBE VIDEO FILMS and released November 2003 this is Volume II of Whistling Giants series dedicated to the ever-popular Class 40s. With scenes from the early 1960s to mid 1980s the video features both original cine and VHS film from that period. Action is fast and furious, including scenes from the North West and North East of England, North Wales and Scotland. As with WGI there are also some surprise locations ! Passenger and freight workings appear including those popular Summer Saturday trains such as the Manchester to Skegness, Yarmouth, Scarborough and North Wales; railtours, freightliners, parcels workings and many more. A view of one of the early withdrawals, 40190, in action. 40009, the last vacuum brake survivor. As always special attention is paid to the soundtrack to ensure maximum enjoyment. Running time 63 mins approx.